Utility & Cycle Fuel Tank Repair Kits have been designed for the special needs of motorcycles and other small fuel tanks such as recreational vehicles, snowmobiles, outboards, generators, etc. Experience the quality and durability of POR 15 for yourself! METAL READY (QT) to remove rust & prepare tank for sealer. 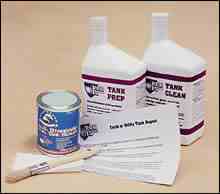 DETAILED INSTRUCTIONS to take you easily through each step of tank restoration.